Netherton United Under 14 manager Simon Roberts, pictured here receiving sponsored kit from Debbie Isham of SAS Utility, will hopefully take one of his teams into the Junior Premier League next season. Netherton United are hoping to enter two of their junior teams in the national Junior Premier League next season. The Junior Premier League is an elite league that includes several Academy sides from professional clubs. Peterborough Sports currently have a side playing in it at Under 16 level. The current Netherton Under 14 team managed by Simon Roberts, who are riding high at the top of the Peterborough Junior Alliance League, will apply to join the Junior Premier League Under 15 age group next season. And the city club are also hoping to enter an Under 14 team into the top-level competition as well. To do that they need to attract some more players. Roberts said: “The new Under 14 elite side will be made up from hopefully the best current crop of Under 13 players (Year 8s) in and around Peterborough. “Players can still play for their current teams in the local Sunday league as Junior Premier League games are on a Saturday and dual signing is permitted as it is a different league set-up. 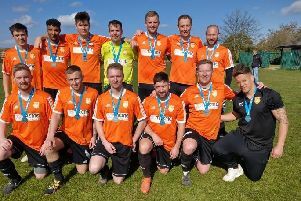 “Netherton still intend to enter a team in each age group into the Peterborough Junior Alliance and Peterborough Youth League next season, as we want to have an elite squad and a grassroots squad in each age group.